A recent post discusses how ineffective index options have been recently in terms of providing “tail risk” protection. Part of the explanation for this has to do with equity markets being range bound, dampening historical volatility. The chart below shows the historical (60 days) volatility vs. the implied volatility (3 months term, at-the-money) for SPY shares (S&P500 ETFs). Earlier in the year implied volatility traded at a discount to historical volatility. 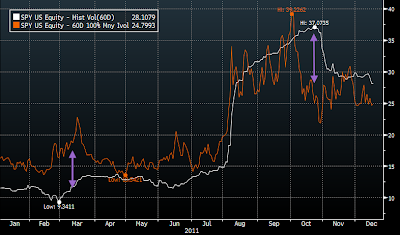 During the peak of the eurozone crisis - Aug-Sep - implied volatility spiked as was expected. 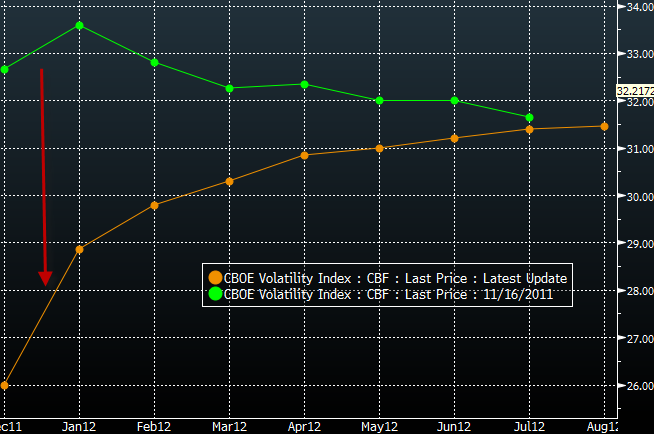 Those who had index put protection on, made money not only on the market declines, but on that volatility spike. In October however we continued to have strong bid for vol (demand for options on SPY) as portfolio managers (concerned about going back to Aug-Sep sell-off) continued to add “tail risk” protection (index puts). Meanwhile historical volatility started declining as the market became range bound. We had a disconnect between the actual volatility and what the market was pricing. In November implied volatility caught up with historical volatility (decreasing option premiums sometimes even on days when the market was selling off), frustrating everyone who tried to hedge with index options. This month historical volatility came off further, making implied volatility look overpriced again – creating the same problem. 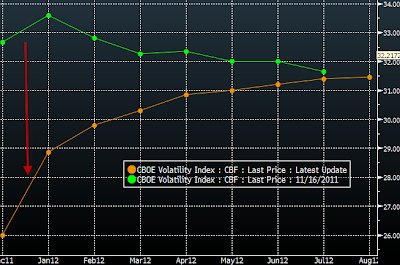 The next chart shows how VIX futures moved in the past month. The market is basically pricing a significantly lower downside risk (lower historical volatility) in the near term, with risks remaining unchanged in the longer term. If the equity market continues to stay range bound or rallies, the longer term implied volatility will come off sharply as well to stay in lockstep with historical volatility.